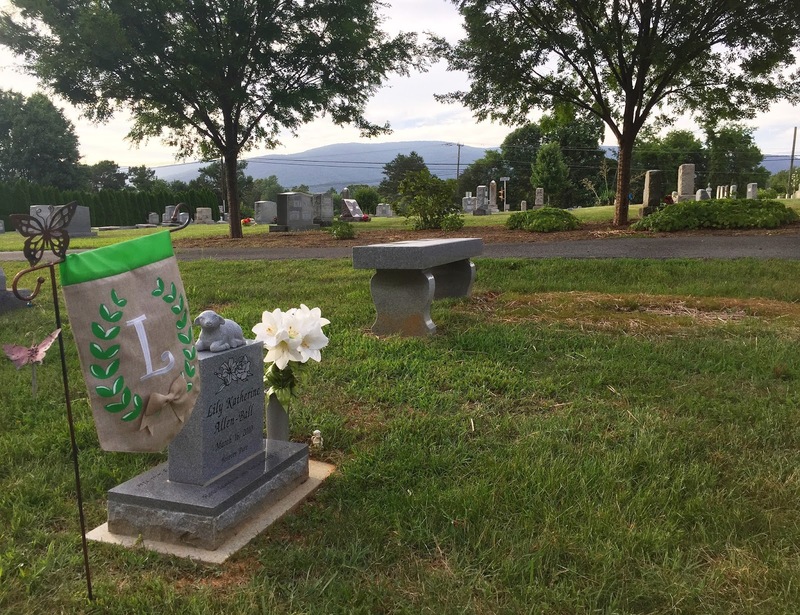 A huge piece of my heart is found here in this cemetery in Virginia. And it is here where my heart is always first drawn when I come back into town. See where the grass is growing in a rectangle by the bench? That's where Bumma is. It's odd coming here now without her. Most people don't have memories with their grandparents spending hours at the cemetery where they'd one day be laid to rest themselves. I should be seeing her white Buick slowly creeping in to meet me here. We'd visit our baby girls together. I'd sit on the grass in front of Lily's grave and Bumma would sit on the bench that bore her husband's name, her daughter's name, and her own name. She'd face me and listen as I'd pore out my heart to her. And in her ever wise and gentle way, she'd understand me and would speak Jesus into the tender and wounded places. She'd watch me as I'd pull the "weeds" around Lily's stone (even though she'd insist it was grass and think I was silly for wanting things so precisely a certain way). We'd talk about how weird it was to see her name and birthdate on the bench and not to see the other date that would one day need to be etched it. Now we know - April 14, 2017. We'd even take lots of photos through the years. Because I wanted to visit my baby and Bumma wanted to come with me, I have all these memories at the place where I now come to visit Bumma too. And it's weird and sad and special all at once. I come here and I talk to Lily and Bumma. And I ask Jesus to tell them things for me. And I rejoice that they are not truly here. But their bodies are... and don't you dare tell me it's not painful to say goodbye to the human body because that is how we know our loved ones on Earth. That is how their souls are represented here. And we miss that representation of them. And we are thankful to have a place we can visit with their name, an honor and a testimony that they were here. Wow! Yes ma'am. Well put, every bit of it...the whole thing. I love that you sent me the same flag as your Lily's. Thank you. I have mine in my lily (Lilly) garden. I love seeing it when I go out.